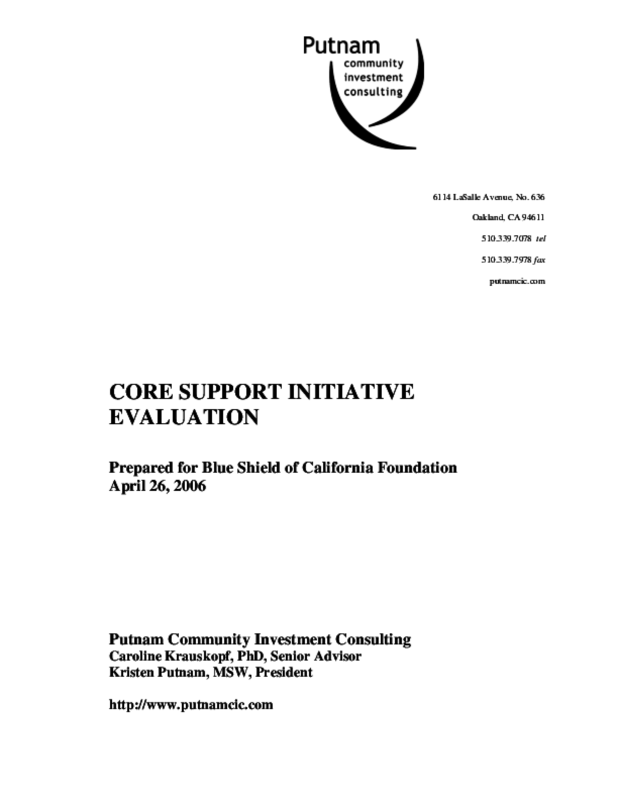 In 2004-05, the Blue Shield of California Foundation (BSCF) provided over $10 million in core support funding to 175 community health clinics, clinic parent corporations, and clinic consortia/networks through its Core Support Initiative. The goal of the Initiative was to strengthen the network of front-line health care providers in California that provide care to California's low income and uninsured populations through the provision of core operating support (also known as general operating support). Grantees were provided two consecutive oneyear grants. Grant sizes ranged from $7,400 to $60,000. This evaluation report shares observations about the impact and perceptions of BSCF's investment, based on information gathered from surveys and telephone interviews. Copyright 2006 Blue Shield of California Foundation, Putnam Consulting Group, Inc.. Copyright holder(s) Blue Shield of California Foundation , Putnam Consulting Group, Inc.